I am doing the old arrive-and-drive this weekend showing up with helmet bag in hand. 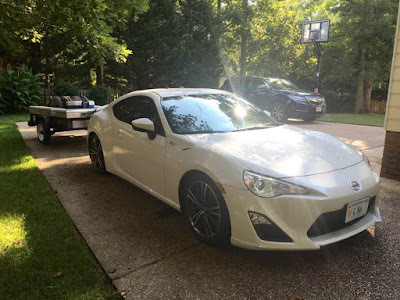 I will be co-driving with my Dad in his C-Street FR-S. The only differences between our cars are the dampers (I've got the pimp shocks....) and the color. He is locked and loaded and in Wilmington while I head to the airport. We are in Group 2 and start Saturday morning at 9am. 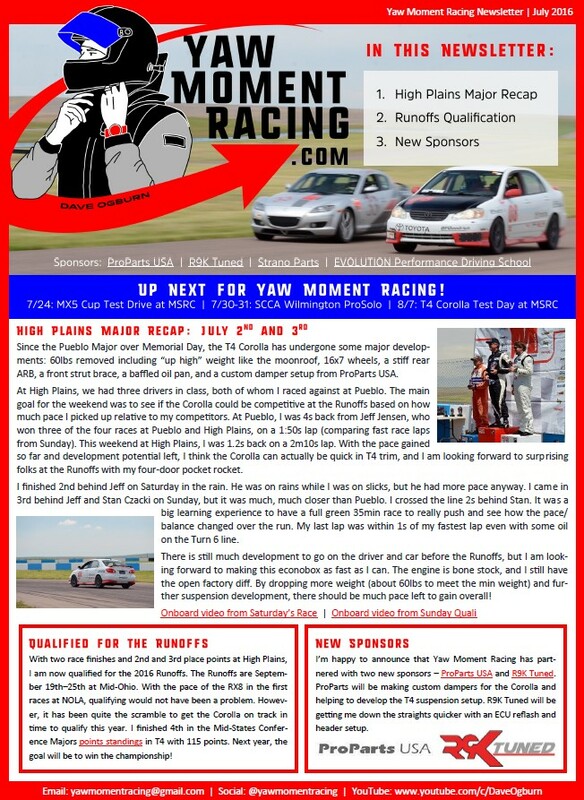 I just sent out the first Yaw Moment Racing newsletter last night. 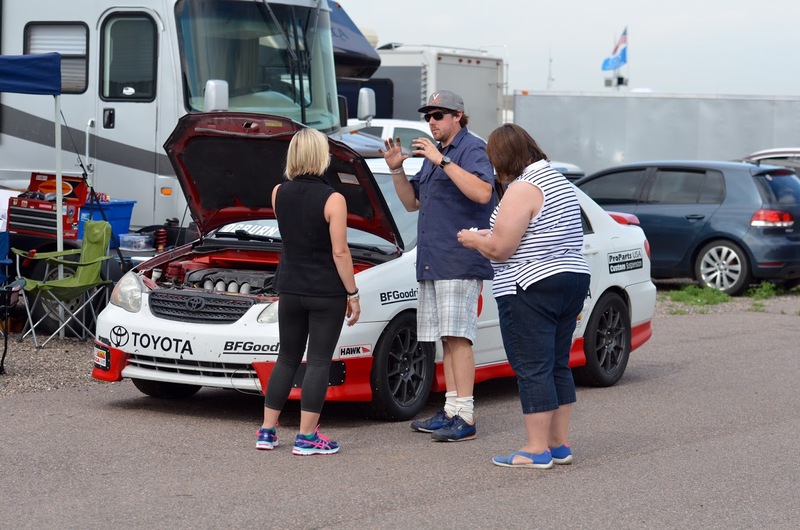 The goal with the newsletter is to keep family, friends, supporters, and sponsors up to date on my racing activities directly to your inbox in an straightforward summary. It is easy to get lost in all the different forms of social media, but this keeps it more direct and personal with an email. My plan is to send one newsletter per month during the racing season and about bi-monthly during the off-season, so expect 8-10 newsletters per year. If you are interested in being on the newsletter mailing list, shoot me an email (see email contact button on the right!). Thanks. 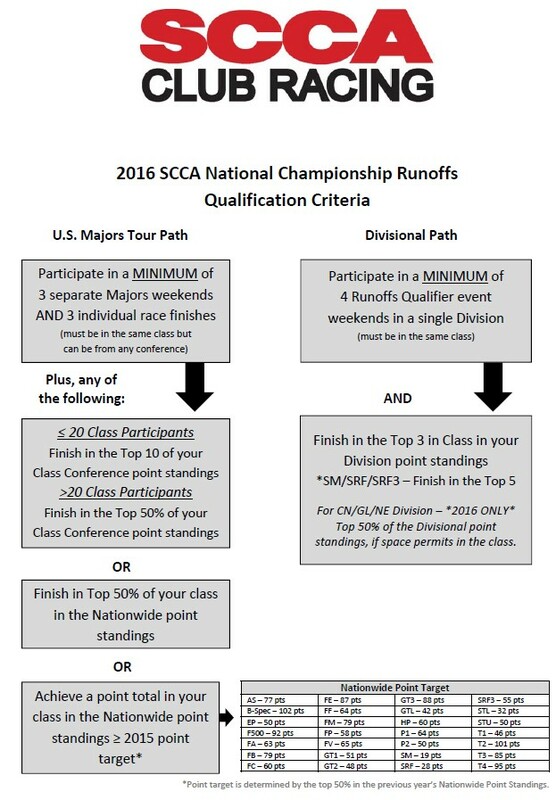 Registered for the 2016 SCCA National Championship Runoffs! The T4 entry list is looking strong so far with 31 drivers and numerous former champs. Can't wait for September! This is onboard video from a quick test session I did in a 2006 Mazda MX-5 Cup car this past Sunday at MSR Cresson. This may be a car I transfer to SCCA T4 road racing for the 2017 Season. Thanks to MER for the chance to drive! I know...that camera is too low. Got to get it up higher next time! 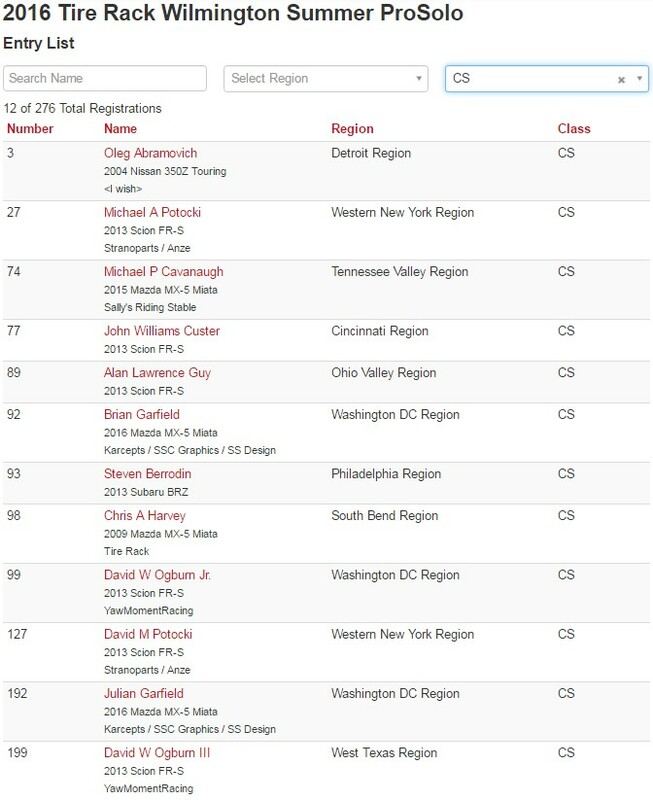 Now Qualified for the Runoffs! 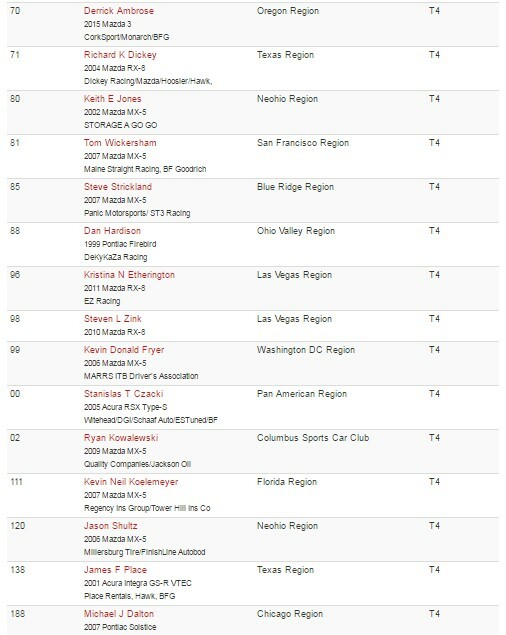 I have officially qualified for the Runoffs, which are September 19th – 25th at Mid-Ohio, through the Majors Tour path. I have six race finishes over three weekends to meet the requirements - technically my Sunday race at NOLA where the engine failed counts as a finish because it happened with two laps to go. With 2nd and 3rd place finishes at the High Plains Major, I am also now good to go for points as well. With the pace of the RX8 in the first races at NOLA, qualifying this year would not have been a problem. 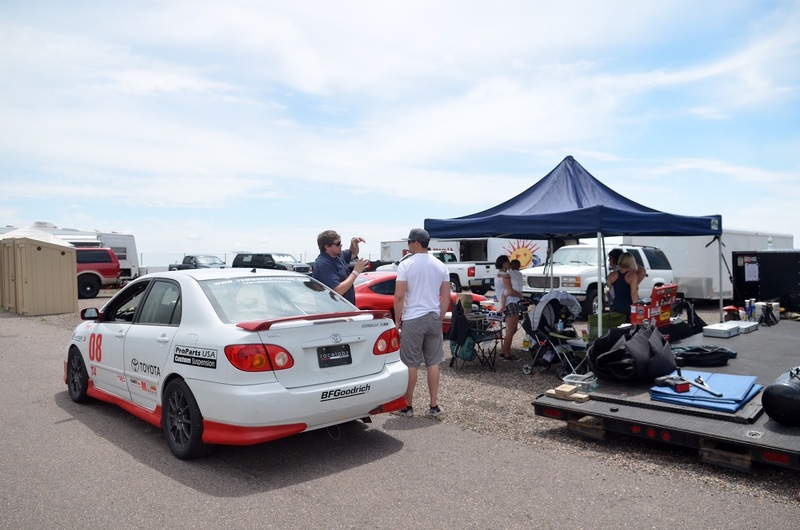 However, it has been quite the scramble replace the broken RX8 and get the Corolla on track in time to qualify. 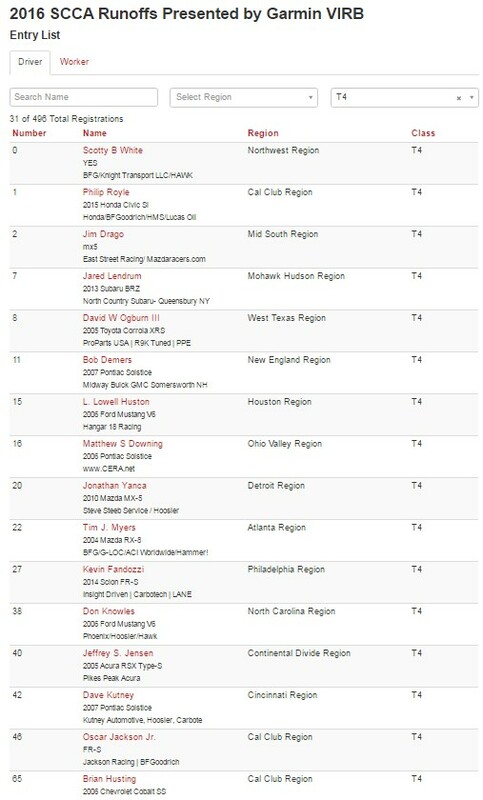 I finished 4th in the Mid-States Conference Majors points standings in T4 with 115 points. Next year, the goal will be to win the championship! Ali, Koni the dog and I went to Harris Hill Road yesterday for some testing in the T4 Corolla. The goal was to test rear spring rates and damper settings. Per the Touring 4 class rules, I have to run a non-adjustable damper. I have a set of adjustable Koni dampers from ProPartsUSA on the car for testing. The plan was to fix the damper settings and then send the dampers back to ProParts to get the adjuster disabled before the Runoffs. That plan will be on hold for now because the test day did not go as planned. I had a failure in the rear suspension in my first couple of laps. Luckily it can be fixed fairly easily and it didn't cause a crash, but it did end the test day. In actuality, the rear suspension issue didn't change the day's result. Unfortunately, Harris Hill has gotten too bumpy to be used to setup a racecar in my opinion. It was definitely bumpy in December when I visited in the RX-8, but it has gotten worse and I am convinced I would have destroyed the car if I had run my whole test plan Saturday. On the lap before the suspension failed, I had pretty much decided that I was putting the car back on the trailer instead of running through any spring/damper changes. It really is unfortunate...H2R has a fun layout and is run by great people. I really enjoy driving the track and the track management is so easy-going and fantastic to work with. There are still many things that the track can be used for, but, for me, setting up a racecar with 2.3+hz natural frequency suspension front and rear isn't one of them. Since the Pueblo Major over Memorial Day, I took about 60lbs out of the car (including some "up-high" weight like the moonroof), went to 16x7 wheels (max allowed) up from 16x6.5, added a stiffer rear ARB, a front strut bar, a baffled oil pan, and a ProParts custom damper setup with ride height adjustment. Big thanks to Jeff Wong and ProParts for getting me the dampers in time for the race weekend! With the ride height adjustment, I was able to get the car down over 2 inches from stock which looked more like a minivan than a racecar!. I focused on weight, wheel and suspension changes for High Plains. I wanted as much time as possible to dial in the suspension before the Runoffs. I am confident in my ability to drive down a straight and click through the gears, so I know I'll find some pace with more horsepower. 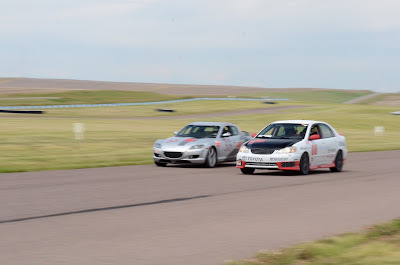 At High Plains, we had three drivers in class, both of whom I raced against at Pueblo. The main goal for the weekend was to see if I picked up enough pace relative to the other guys where it would even be worth it to make the trek to the Runoffs. 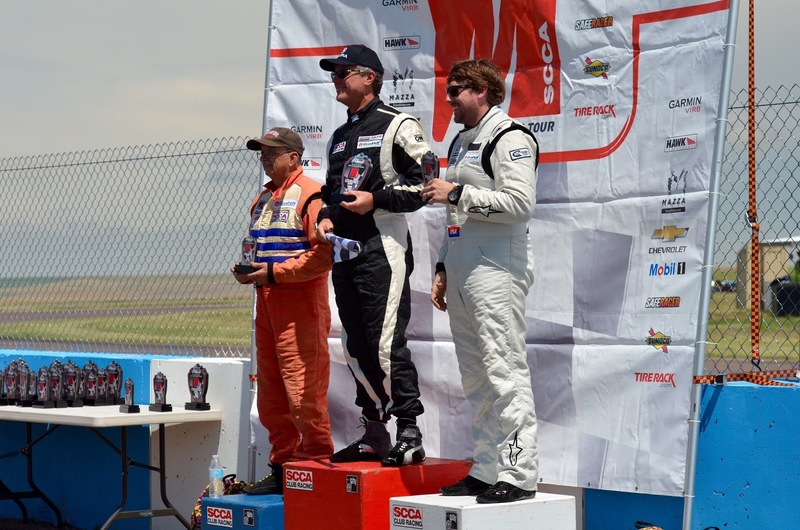 Overall, I clawed back enough pace from Jeff Jensen, who won both Sunday races at Pueblo and High Plains, to make the Runoffs a possibility this year. 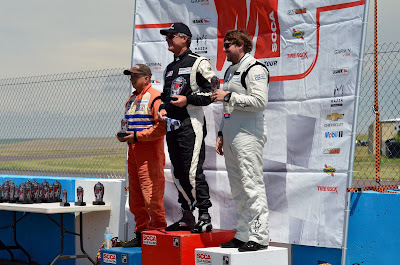 At Pueblo, I was 4s back from Jeff J on a 1:50s lap (comparing fast race laps from Sunday). 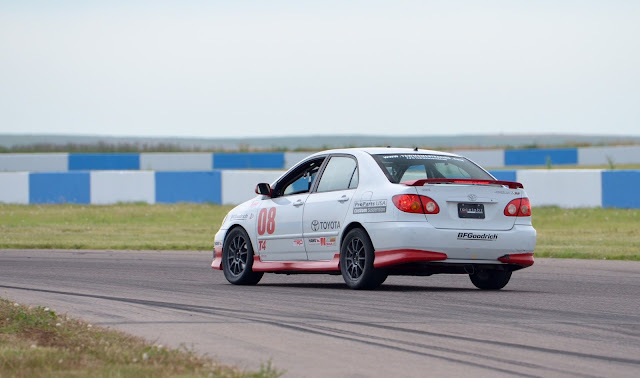 For the High Plains Sunday feature race, I was 1.2s back on a 2m10 lap. I finished 2nd behind Jeff on Saturday in the rain. He was on rains while I was on slicks, but he had more pace anyway. I came in 3rd behind Jeff and Stan Czacki on Sunday, but it was much, much closer than Pueblo. I crossed the line 2s behind Stan. It was a big learning experience to have a full green 35min race to really push and see how the pace/balance changed over the run. My last lap was within 1s of my fastest lap even with some oil on the turn 6 line. 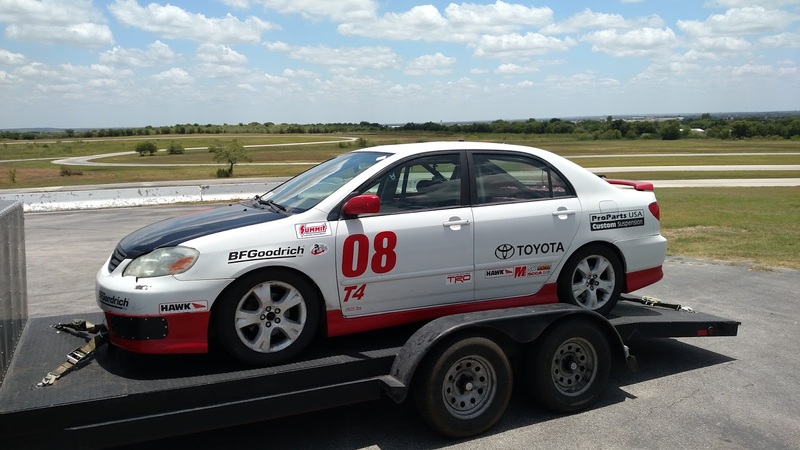 The second goal for the weekend was to qualify for the runoffs. With the 2nd and 3rd place finishes at High Plains, I am now officially qualified - more details on this process later. 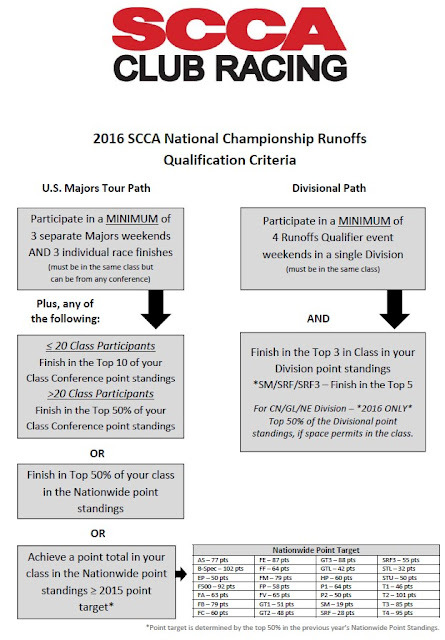 I'm very much looking forward to my first Runoffs start in September! There is still much development to go on driver and car before the Runoffs, but I am looking forward to making this econobox as fast as I can. The engine is bone stock, and I still have the open factory diff. By dropping more weight (about 60lbs to meet the min weight) and further suspension development, there should be much pace left to gain overall. Thanks to my parents and Ali for helping me thrash on the car over the race weekend and to the Eisele clan and James D for making the trek out to High Plains to watch. 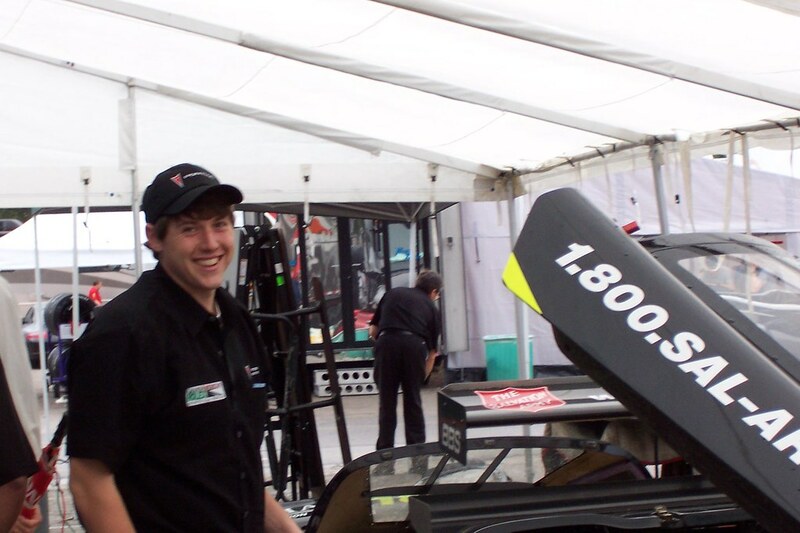 Also, thanks to Lane Borg and Stefan Waller for helping me get the car together the week before the race. Also congrats to Jeff Jensen for the double win at High Plains and for Stan Czacki picking up the Mid-States Conference T4 Championship! I had an issue with the GoPro Camera during Sunday's race so I have no onboard video. Next up I have a test session this Saturday at Harris Hill Road for suspension testing. 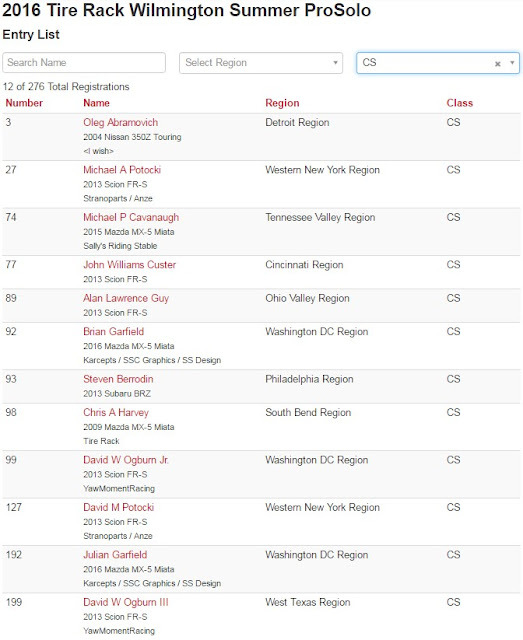 My next race is at the end of July for the Wilmington ProSolo event. I'll be co-driving with my Dad in his C-Street FRS. I went back and edited the onboard video from NOLA Motorsports Park back in February. This is highlights from the win in Saturday's 25min race. In Group 5, we had E Production, F Production, STL T3 and T4 with 41 total cars. This is the start and finish of the 25 minute Saturday race at the 2016 SCCA Majors tour at High Plains Raceway. I started 2nd and finished 2nd in Touring 4 class. It rained for about 2 hours Saturday morning stopping 30 minutes before the race start. I didn't have rain tires with me so I ran on the BFG R1-S dry race tires. It was a bit dicey for the first 15min but the track came in with about 5 min to go. I had the fastest race lap in T4 on the final lap but was already well behind the 1st place Acura RSX that started on rain tires. We finished up the Mid-States Conference US Majors Tour this weekend at High Plains. I competed in my 2005 Toyota Corolla XRS that I am developing for T4. Here is some onboard video from Sunday's qualifying session which was our first dry session of the weekend. Unfortunately, I had a camera problem and don't have any video of the Sunday feature race. More details and photos from the race later in the week!